When you think of a getaway to the Coachella Valley, you’re most likely envisioning pretty scenery, pool time, and sunshine. Those things are fine, but they no longer matter. Because now the J.W. Marriott in Palm Desert will send a 10-pound, three-foot-wide, one-foot-tall, bright pink, sprinkle-covered doughnut to your bedroom, and everything has changed. Why are they doing this, you might ask. 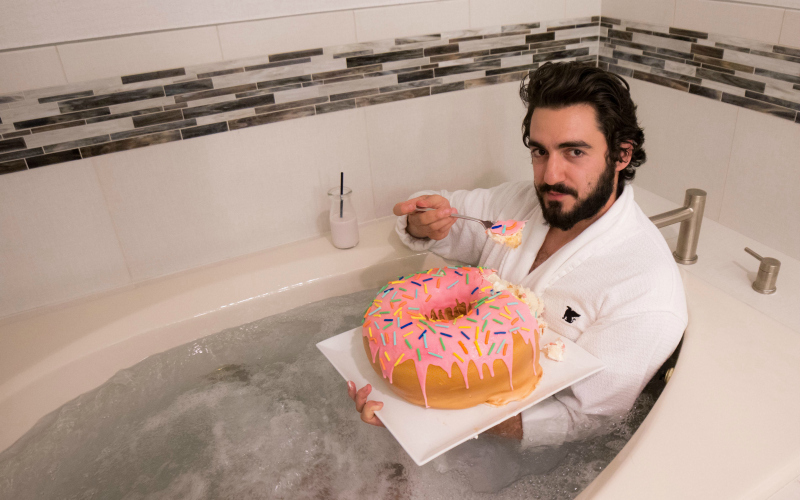 Is it simply so they can make guests request “The DoNut Disturb Package” when booking a room and then secretly laugh at how silly we sound just like those waiters at Café Gratitude probably do as soon as you utter “I’ll have the ‘I Am Liberated,’ please”? Well, that really is the name of the package, so infer what you will. 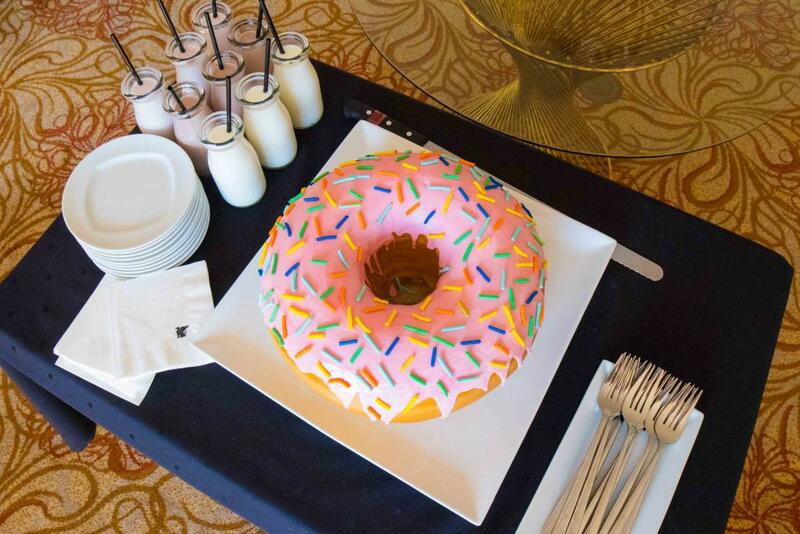 For $219, booking the package gets you the room, the village-feeding doughnut, and a few milkshakes to wash it down because you’re already eating an enormous doughnut so it’s obviously a cheat day. They’ll also include a $50 credit for use at the spa and a round of golf, but making use of those things is dependent on you not collapsing in a sugar-induced coma. The package will be available on select dates through April 30, 2018. Because we keep it very real here, we do have to let you know that the doughnut is maybe actually a cake in the shape of a doughnut, but as you spoon the layers of Tahitian vanilla bean cake, raspberry jelly filling, and pink fondant frosting into your face, we wager you’ll forget all about that semantic distinction. 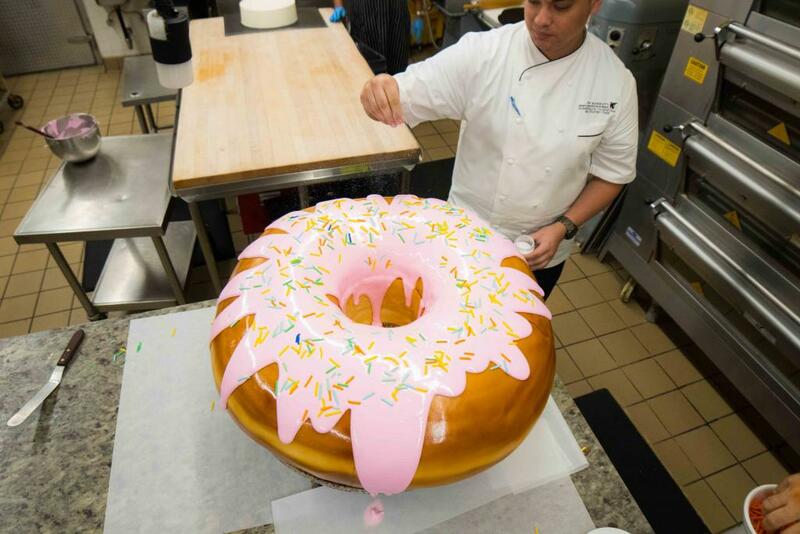 Oh, and to launch the promotion, Executive Chef Peter Smith and Executive Pastry Chef Dominique Valenzuela decided to show us all what a really ridiculously huge doughnut would look like: They made a 100-pounder for a “Sugar High Happy Hour.” Never let anyone stand in the way of your dreams. RELATED: Your Definitive Guide to the 22 Most Important Doughnuts in L.A.
Next articleEver Noticed Those Mysterious Metal Circles Embedded in the Streets of L.A.?